Gottemoeller: “A demonstration that we stand together” - Atlantik-Brücke e.V. Part XIII of our series: Rose Gottemoeller regards the Alliance’s security guarantee for the Baltics and Poland as reliable. NATO Deputy Secretary General demands that Russia complies with its commitments to transparency of its military exercises in this region. 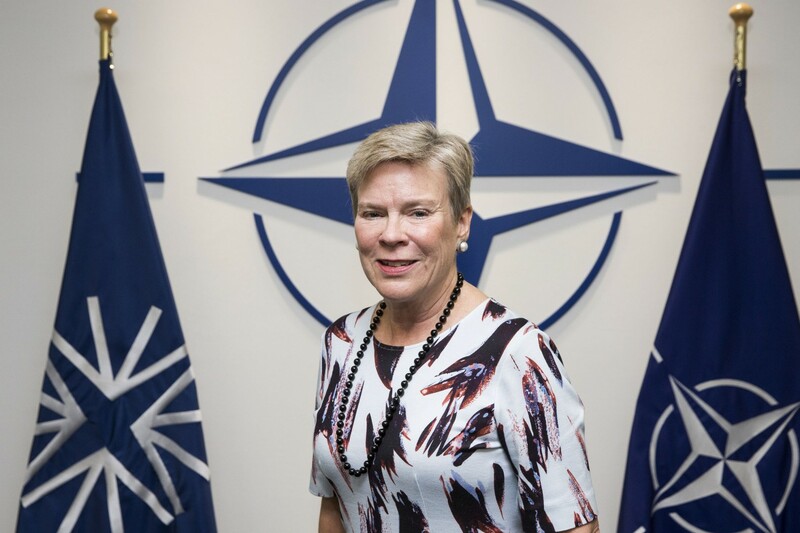 In conversation with Atlantik-Brücke Gottemoeller also stresses that the Alliance’s new command structure will be “robust, agile and fully fit for purpose”. Mrs. Gottemoeller, Russia is trying to expand its spheres of influence. Especially the Baltics and Poland feel threatened by Russia’s aggressive behaviour. How reliable is NATO’s security guarantee in this European region? In recent years, Russia has threatened and used military force against its neighbours. NATO has responded in a defensive and proportionate way. The response includes the four multinational battlegroups that are operational in Estonia, Latvia, Lithuania and Poland. Our measures are strictly defensive, proportionate, and in line with our international commitments. They aim at preventing conflict and preserving the peace. This is a clear demonstration that we stand together, and is the essence of Article 5 of the Washington Treaty. But our deterrence and defence does not rely on four battlegroups alone. They are part of a broader posture that involves national home defence and other NATO forces. We have, for example, tripled the size of our multinational NATO Response Force to 40,000 troops – with a 5,000-strong spearhead force ready to deploy within 72 hours. We have also enhanced air patrols over the Baltic and Black Seas. Our defences are now stronger than at any point since the Cold War. That sends a clear signal. Our policy towards Russia is consistent: strong defence and openness to dialogue. We are delivering on both tracks. While our practical cooperation with Russia has been suspended, we remain open to a periodic, focused and meaningful dialogue. We held six meetings of the NATO-Russia Council over the past two years, and are continuing to look for further opportunities. There are regular reports about a gap of exercises between NATO and Russia. How severe is this problem in the perception within the alliance’s Headquarters? All nations have the right to exercise their armed forces; it is essential that in doing so they respect their commitments to transparency and predictability. Transparency has also been a priority for NATO in its discussions with Russia in the NATO-Russia Council, and it will remain a priority as we continue our dialogue with Russia. Exercises such as ZAPAD last year – together with the overall increase in Russian military activities – underline the need for close dialogue between NATO and Russia to avoid incidents and miscalculations. Russia has regularly under-reported the size of its exercises to avoid mandatory observations by the OSCE. Since the end of the Cold War, Russia has never opened an exercise for the mandatory observation outlined in the Vienna Document. We continue to urge Russia to be fully transparent about the scope of its exercises and to comply with the requirements of the Vienna Document. Allies are also making efforts within the OSCE to modernise the Vienna Document in order to close loopholes and ensure transparency of military exercises. As for what NATO does in this area, we ensure that all we do is defensive, proportionate, and in line with our international commitments – including those outlined in the Vienna Document. Exercising is important to test our capabilities and make certain that we are fit for purpose and ready for the challenges we might face. In May and June, NATO Allies will conduct a range of exercises in the Baltic Sea region – testing the ability of Allied forces to operate together. In the bigger picture, our measures strike the right balance between a greater military deterrence in the east and the ability to quickly send reinforcements. So, our approach remains firm, defensive and proportionate. We will do what we believe is necessary to ensure that we are capable of defending our territories and populations. But I want to make clear that we do not want a Cold War, and we will not let ourselves be dragged into a new arms race. NATO remains determined to defend all Allies against any threat. We will maintain a safe, secure and effective nuclear deterrent, as well as strong conventional forces. And we will continue to engage in a meaningful dialogue with Russia, to increase predictability and reduce risk. NATO’s new command structure with additional headquarters aims to accomplish a better capability of deploying troops. Do you think the potential deterrence towards Russia deriving from this step goes far enough? Our ability to deploy troops wherever they are needed is key to deterrence in peacetime and to our collective defence in times of crisis. This must go hand in hand with a NATO command structure that is robust, agile and fully fit for purpose. Last November, NATO Ministers agreed in principle on the outline for such an adapted NATO Command Structure, and in February of this year, Allies agreed the proposed design for the adapted command structure. We will discuss resources, timelines and locations at the next Meeting of Defence Ministers in June. The new command structure will include a number of new elements. A Command for the Atlantic will help protect the sea lines of communication between Europe and North America. There will be a new Command to ensure the mobility of our forces within Europe. We also agreed on the need for a renewed focus throughout the command structure on logistics and movement, situational awareness, resilience and on cyber defence. I expect we will finalise all aspects of the adapted structure ahead of the Brussels Summit in July. Since 2014 there has also been good progress in improving national legislation, removing many bureaucratic hurdles to allow us to move forces across Allied territory. This is important, but we still have work to do. We need to have enough transport capacity at our disposal, and we need to improve infrastructure, such as roads, bridges, railways, runways and ports. This is not a job for NATO alone – it requires close coordination across national governments and with the private sector. The EU has an important role to play as well, so NATO and the EU will continue to work very closely on this vital issue. Russia has supposedly violated the INF Treaty by having developed the ballistic missile SSC-8 that is expected to have a range of more than 500 kilometres. What role does this threat play in NATO’s strategic considerations? The Intermediate-Range Nuclear Forces (INF) Treaty eliminated an entire category of nuclear weapons that threatened Europe, and which were associated with the ability to launch attacks with little warning. We remain fully committed to the preservation of this historic arms control treaty. The INF Treaty is a crucial element of Euro-Atlantic security. Full compliance with the INF Treaty is essential. The United States has determined that Russia is in violation of the INF Treaty. US Defence Secretary Mattis updated Allies on this issue in November of last year. In December, Allies issued a statement calling on Russia to address these serious concerns in a substantial, transparent and verifiable way. Allies welcome the continued efforts by the United States to engage Russia to resolve concerns about Russia’s compliance with the Treaty. The relationship between NATO and Russia is very strained since the annexation of Crimea. Which approach should NATO take in order to accomplish a convergence with the Kremlin? We have seen a broad pattern of reckless behaviour by Russia over many years. This includes the illegal annexation of Crimea, the military support to separatists in Eastern Ukraine, and its military build-up from the North of Europe to the Middle East. Russia’s military presence in Moldova and Georgia is against the will of either of these countries’ governments. There have also been attempts to subvert democratic processes and institutions, and we have seen an increase in cyber attacks. In March, Allies expressed their deep concern about the nerve agent incident in Salisbury in the United Kingdom, the first use of a nerve agent on Alliance territory. Subsequently over two dozen countries expelled people who had been accredited as Russian diplomats from their countries. NATO’s Secretary General withdrew agreement for the appointment of seven individuals accredited to the Russian Mission to NATO and denied the pending accreditation of three others. This is certainly a challenging time, but NATO’s policy remains unchanged. We have strengthened our deterrence and defence in response to Russia’s actions, while we remain open for a meaningful dialogue with Russia. We held six meetings of the NATO-Russia Council since 2016, and we are working to hold another. This dialogue is difficult – but it is vital to increase transparency and reduce risk. So, NATO’s approach to Russia combines strength and dialogue. And we are delivering on both fronts. Michael O’Hanlon, a Senior Fellow at the Brookings Institution, supports the hypothesis that the end of NATO’s eastward expansion and the implementation of a zone of neutral nations would reduce tensions with Russia. How do you assess this proposal? Russia’s western borders have never been safer. NATO enlargement poses no threat to Russia. NATO’s Open Door policy is enshrined in the Washington Treaty and has helped spread stability and prosperity, just like the European Union’s enlargement. And Russia has benefitted from this stability and prosperity as well. Our door remains open to European nations able to undertake the commitments and obligations of membership, and contribute to security in the Euro-Atlantic area. Every country has the right ”to belong or not to belong to international organizations, to be or not to be a party to bilateral or multilateral treaties including the right to be or not to be a party to treaties of alliance.” These principles are enshrined in the 1975 Helsinki Final Act. All OSCE member states have signed up to these principles, including Russia. NATO membership is not imposed on countries. All countries that have joined NATO have done so freely, and in accordance with their domestic democratic processes. To join NATO, countries are expected to adhere to the values of NATO, and to meet strict political, economic and military criteria. NATO Allies are keeping the progress of aspirant countries under close review. In any event, accession to NATO is for individual candidate countries and the Alliance to decide. No third country has the right to interfere in this process. What role will NATO be playing in transatlantic security policy in ten years’ time? NATO has kept the peace in Europe for almost seventy years. It is the most successful military Alliance in the world because we have been able to adapt. In an unpredictable world, we will continue to adapt to new challenges and continue to keep our nations and populations safe and secure.